I’m still at the Antigua Sailing Week (ASW) and have been promoted on the SV Spirit of Juno. I’m no longer tailing the back stay. I’m on midships instead. 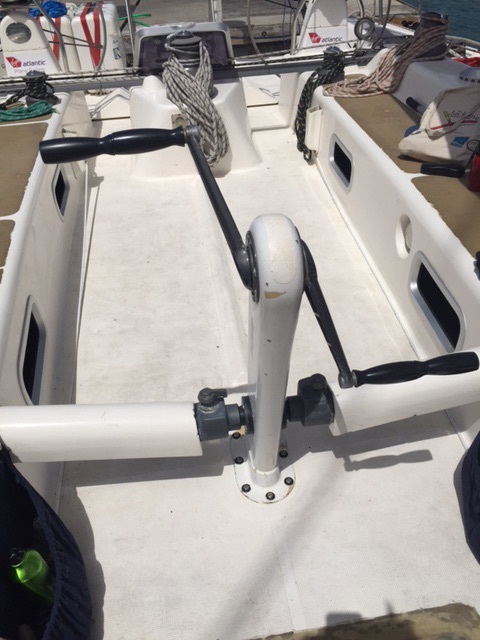 Midships is where me and three other women control the smaller sail at the front of the boat called a jib. We use winches to tighten the line that runs to the jib. Here is a picture of the coffee grinder winches that we use to tighten the jib. It is very physical work, and feels like interval training. So it was perfect for me. Much like hill climbing in cycling, I don’t mind pushing myself when the reward is around the corner. And, in this situation the reward is riding the rail on the high side (called hiking). Journalist and blogger, Jonathan Russo spent the past few days on our boat, SV Spirit of Juno. His article called, “Antigua Sailing Week: Another Day in Paradise” is about his experience onboard this week. His article appears in Soundingsonline magazine. I enjoyed reading Russo’s description of how our participation at ASW is a bit like playing golf with Tiger Woods. There are some very high-caliber boats and sailors here this week. 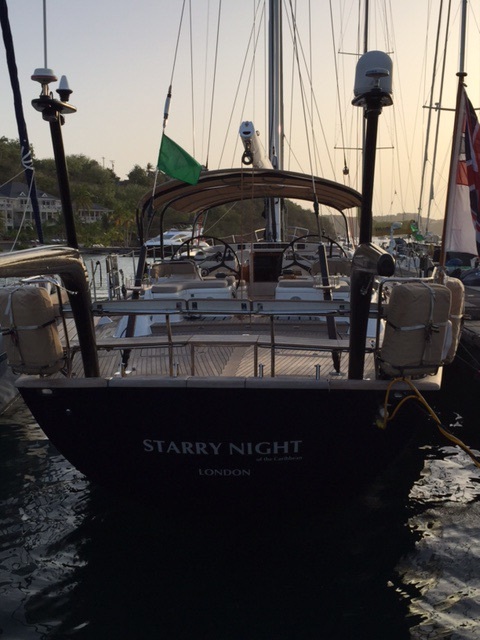 We are racing against SV Starry Night, for example, which is an Oyster 82. It is a Lamborghini of the Sailing world and has a professional racing crew. In contrast, we are on an Farr 65. Designed for racing. It is very industrial looking. As well, our crew is still sorting out who does what. But we are having fun. On one occasion we missed the starting gun of a race due to miscommunication. The jib should have been up by the time we reached the start line. Instead, we sailed past the racing officials with two members of our crew sleeping on the jib.